Sorry but I have to say this. 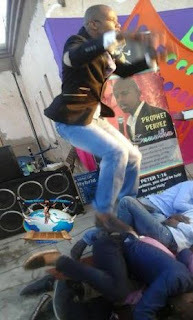 This guy is a maniac disguising as a man of God and needs to be stopped. 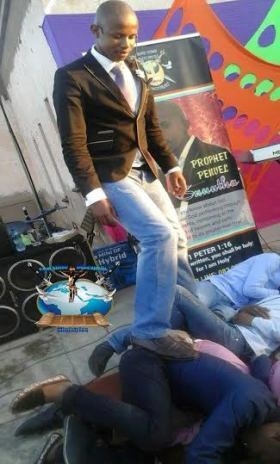 The South African pastor, who has in the past committed outrageous acts with his congregation and has had his church shut/burnt in the past, has struck again. 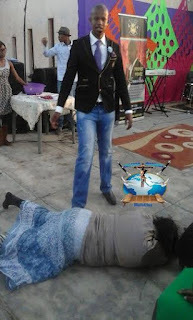 This time, while ministering to his congregants, Penuel Mnguni, commanded some of them to fall into a deep sleep. He then stepped on top of their bodies and jumped up/down. After doing this, he allegedly commanded them to wake up. When they did, he asked if they felt any pain and they all confirmed not to have felt anything.